This is another good Vij’s recipe to go alongside the Coconut Curried Vegetables. I’ve “vegan-ized” it by using olive oil instead of butter. The other thing you can do is add dried currants to get a good hit of iron and fibre. My kids don’t love them so I tend to leave them out but you could also just have a little bowl-full on the side for customized additions. 1. To prepare the rice: wash rice twice in cold water. Soak rice in 3 cups of water for 15 to 20 minutes. Drain rice. 2. In a medium pot with a lid, combine rice, 3 3/4 cups of water, olive oil and salt on high heat. As soon as the rice starts to boil vigorously, reduce the heat to low, cover and simmer for 18 to 20 minutes. Turn off the heat, but do not remove the lid. Allow rice to sit for about 5 minutes, then remove the lid and set aside. 3. 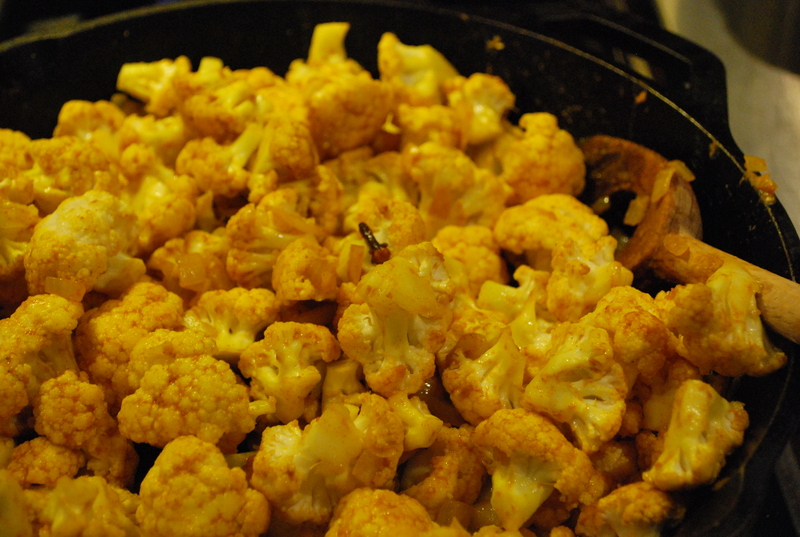 To prepare the cauliflower: In a separate frying pan or a wok, heat cumin seeds in oil on medium-high heat. Once seeds have sizzled for 30 to 45 seconds, reduce the heat to medium and add onions and cloves. Sauté the onion for 8 to 10 minutes or until brown. Add turmeric, jalapeno and salt and sauté for another 2 minutes. Add cauliflower, stir well and stir-fry for 5 minutes. Reduce the heat to medium-low, cover, and cook for another 5 to 8 minutes, until cauliflower is cooked but still firm and not too soft. 4. Add cauliflower to rice and combine well. Add cilantro and stir with a large fork until the rice is completely yellow from the turmeric.